Hello, and welcome back to Frightful Fridays! I am partially making up for the absence with a pair of entries today, so I've got an unusual cat and dog for you. The staubvolkekatze is a curious earth elemental with an appropriately cat-like form. Meanwhile, the pugbug (name courtesy of Paris Crenshaw) hides its alien appearance behind the pug's equally alien appearance. Thanks to Derek for the find on the staubvolkekatze, and to Patrick for the find on the pugubg! I hope you enjoy both creatures, and I'll be back with another pair of monsters to get back on track. Thanks for reading! A billowing cloud of dust moves of its own accord and forms the face of a cat. Choking and Stinging Dust (Ex) A creature struck by a staubvolkekatze’s slam attack also takes 2d6 points of piercing and slashing damage. Additionally, the creature must succeed at a DC 12 Fortitude save or become sickened for 1d4 rounds. If it already has the sickened condition from this ability, it instead becomes nauseated for the duration. The save DC is Constitution-based. If a creature ends its turn adjacent to the staubvolkekatze, the creature takes 1d6 points of piercing and slashing damage. Death Curse (Su) If a staubvolkekatze dies, all creatures it damaged during the previous minute are affected as if by cup of dustAPG (DC 13 Fortitude negates). Vulnerable to Wind (Ex) A staubvolkekatze takes 1 point of damage if it is subjected to strong winds. Severe winds deal 1d4 points of damage to the staubvolkekatze, and more powerful winds require it to succeed at a Fortitude save (DC 10 + 1 per 10 mph) to avoid destruction. A staubvolkekatze is an inquisitive earth elemental with a weak cohesion in the dust particles making up its form. Scholars speculate that the first staubvolkekatze sprung into existence as a result of a larger earth elemental’s disintegration. The creature patterned its appearance after the first living being it encountered—a cat—and all staubvolkekatzen take the same appearance. If left to its own devices, a staubvolkekatze is docile and will not attack. It follows someone it finds interesting and indulges its curiosity as long as its focus of attention allows it. Other than it becoming bored, the only non-hostile means of discouraging its attention is to subject it to powerful winds. A staubvolkekatze’s curiosity leads it to ally with spellcasters who can communicate with it. A 7th-level spellcaster with the Improved Familiar feat and the ability to speak Terran can select a staubvolkekatze as a familiar. The creature loses its death curse ability when it becomes a familiar. The little dog’s face tears open to allow an arachnoid creature to crawl out of it. Dog Shell (Ex) A pugbug spends most of its life in a hardy dog shell. As a full-round action, it can extract itself from the shell, leaving it intact for reentry. Upon doing so, it loses its natural armor bonus and DR, but its speed increases by 10 ft., and it gains a climb speed of 20 ft. (adding +8 to its Climb checks). Pugbug Poison (Ex) Bite—Injury; save Fort DC 15; frequency 1/round for 4 rounds; effect 1d4 Dex; cure 2 consecutive saves. Shellburst (Ex) As a swift action, a pugbug can burst forth from its dog shell, destroying the shell in the process. This gory display forces all creatures that see it to make a DC 14 Will save. Failure causes a victim to become shaken. A global war ruined a distant world populated by intelligent arachnoid and insectoid creatures. The arachnids won the war, but their planet will soon stop supporting life. They discovered a new world with an environment similar to that of their world, and their greatest minds developed a way to travel to their potential new home. Exercising caution, they elected to send a handful of scouts to discover whether the populace would welcome their arrival, or, barring that, whether they could destroy or enslave the inhabitants. The scouts enjoy crafting disguises for themselves from other creatures, and they formerly used the carapaces of their insectoid enemies to infiltrate their camps. During their first forays into this world, they discovered the ubiquity of dogs and the access the animals had to various locations. They decided to assume the form of pugs, since pug eyes provide them with a perfect disguise for their overly large eyes. Their species name is an unpronounceable set of clicks mixed with pheromones, so they are known as pugbugs to those that have uncovered their ruse. Pugbug scouts maintain their disguises while they are on this world and only extract themselves from their shells when they have been found out and must escape. In order to preserve their disguises, they forgo applying acid damage and poison to their bites. Pugbugs are insectivores, but they find meat palatable and will eat scraps typically provided to dogs. 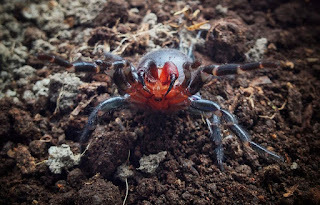 They have also discovered that digging around an ant mound is not uncommon behavior for dogs, so they can supplement their diets without arousing suspicion. Happy Halloween! (for those of you on the West Coast) Today got away from me, so this is going up just a little late. I wanted a dragon to finish up the week, and this seems suitable for the season. Weeping willow dragons are guardians of graveyards, but they see undead creatures as a reasonable component of the natural order, so they have no problem with ghouls and vampires roaming around. They have immunity to many undead powers, so they present formidable foes for creatures that think they can take advantage of the dragons' outlook. I hope the weeping willow dragon is to your liking (along with all the other spooky monsters from this week), and I'll be back on Friday with another monster. As always, thanks for reading! Close to what I was looking for. It's a great illustration. 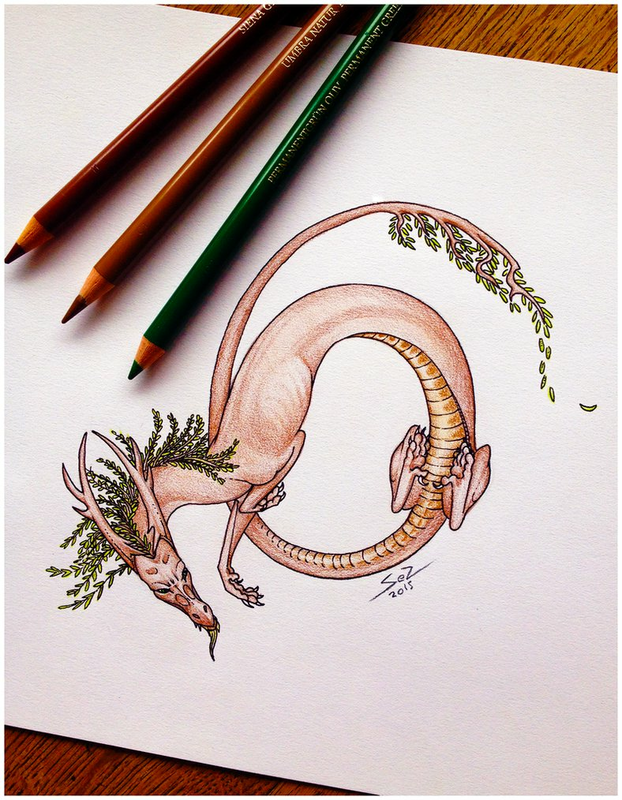 This draconic creature has bark-like skin and leaves drooping down to the ground. It glares with cold menace. Call to the Dead (Su) An old or older weeping willow dragon can affect intelligent undead with mind-affecting effects. Gloom (Su) A very young or older weeping willow dragon reduces the illumination level in a 30-foot radius by one step to a minimum of dim light (it does not affect areas of dim light or darker). This darkness is treated as a 2nd-level spell for purposes of overcoming it. An adult or older dragon reduces the illumination level by up to two steps, increases the radius to 60 feet, and can reduce the illumination level to darkness. Its darkness is treated as a 4th-level spell. A wyrm or older dragon reduces the illumination level by up to three steps, increases the radius to 90 feet, and can create an area of darkness similar to that created by deeper darkness. Its darkness is treated as a 7th-level spell. Immune to Negative Energy (Su) A weeping willow dragon takes no damage from negative energy. It is also immune to ability drain and energy drain. Living Graveyard (Su) A great wyrm weeping willow dragon can bring the graveyard it calls home to life. This acts as per the animate objects spell, but it can choose different objects as a swift action at the beginning of its turn. Plant Traits (Ex) In addition to dragon immunities, a weeping willow has plant immunities (mind-affecting effects, poison, polymorph, and stunning). Spell-Like Abilities (Sp) A weeping willow dragon gains the following spell-like abilities, usable at will upon reaching the listed age category. Young—ghost sound; Juvenile—ray of enfeeblement; Adult—command undead; Old—enervation; Ancient—eyebite; Great wyrm—finger of death. Undead Guardian (Su) An young adult or older weeping willow dragon grants channel resistance to undead within its frightful presence aura. The bonus equal the dragon’s Charisma modifier. See in Darkness (Su) An ancient or older weeping willow dragon can see in magical darkness. Hello, and thank you again for joining me in this celebration of three years of monster blogging. Today's post is on its rightful night, too. I couldn't let this mini run of monsters go by without including a spider monster. They're inherently creepy (at least to me), but I added a little more by having this spider drop its babies off in its victim, so they can gnaw on its brain and then make a home in the victim's skull and pretend to be him or her. That is a thing I could see sentient spiders doing, but that's just me. I hope you enjoy the skull spider, and I'll be back tomorrow with the grand finale for this week's run. Thanks for reading! Eight bristled, segmented legs support a humanoid skull with scraps of hair and rotting flesh making the victim’s features somewhat recognizable. Deposit Spiders (Ex) If a skull spider successfully grapples an opponent, it can deposit dozens of miniscule spiders in the victim as a swift action. At the beginning of the victim’s next turn and each minute thereafter, it must succeed at a DC 22 Fortitude save or take 1d6 points of Charisma drain. The victim is unaware of this drain, and a successful DC 20 Heal check is required to discover the infestation. When the victim reaches 0 Cha, one of the minute spiders grows to its adult size and takes control of the victim. The spider retains all of the victim’s knowledge, abilities, and skills as well as its own. 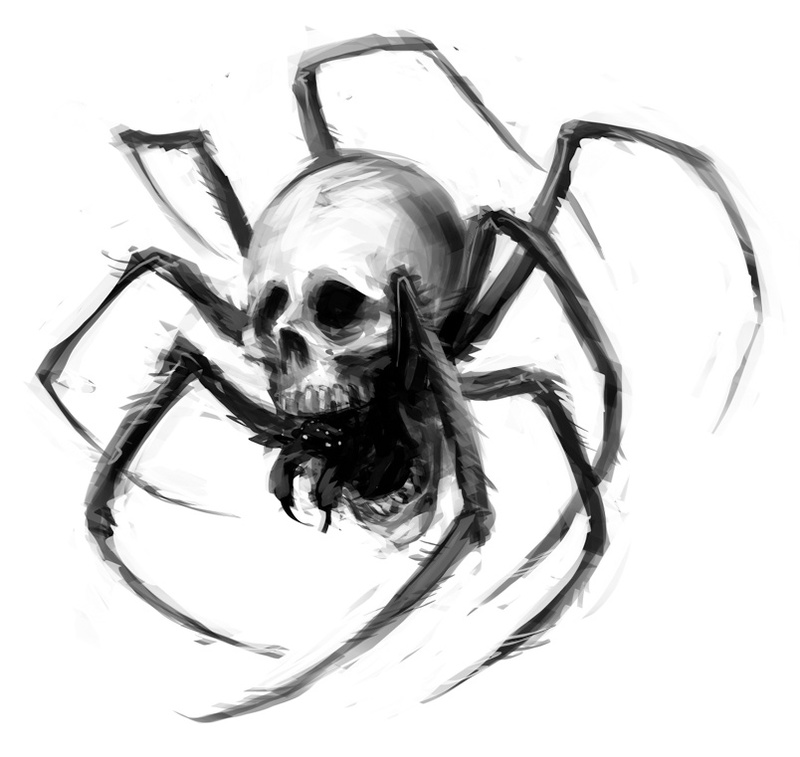 Removing the spiders requires area of effect damage equal to one-fourth the skull spider’s maximum hit points. Any spell or effect that harms vermin also works on the spiders. Hive Mind (Ex) If within 300 feet of each other, no skull spider is considered flanked or flat-footed unless they all are. Skull Spider Poison (Ex) Bite—Injury; save Fort DC 22; frequency 1/round for 4 rounds; effect 1d2 Dex; cure 1 save. The save DC is Constitution-based. 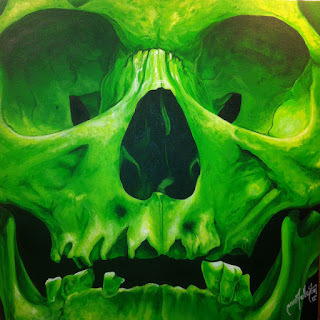 Skull (Ex) A skull spider typically inhabits a humanoid skull when it begins combat. As long as it does so, it gains hardness 5, but all its movement rates decrease to 15 ft., it takes a –4 penalty to Dexterity, and it loses the benefit of improved evasion. The spider’s statistics with the skull are Ref +12; Defensive Abilities hardness 5; Speed 15 ft., climb 15 ft.; Melee bite +21 (1d4–1 plus grab and poison); Dex 25; CMB +17 (+21 grapple); CMD 27 (35 vs. trip); Skills Escape Artist +14, Stealth +19. Hailing from a distant world where they destroyed its civilizations, skull spiders traveled to this planet to start their conquest anew. These aberrant creatures have a spider-like appearance, but they are not true spiders. They feast on brain tissue and prefer brains belonging to intelligent creatures. After feeding, they gain the memories and abilities of the creature they consume, and they roost in the victim’s skull and impersonate the victim. Their stolen memories fade over time, however. After a three- to five-year period, the spiders bud offspring and detach themselves from their host, using the skull as armor and leaving a gory, headless body behind. Until this time, skull spiders typically conduct themselves as their victims would behave and gain new experiences to share with other skull spiders, including their offspring. Skull spiders gather in groups for mutual protection and information sharing. Small groups infiltrate a settlement and slowly convert the inhabitants. If skull spiders exclusively populate the settlement, the creatures send out a reconnaissance group to scout for a suitable spot to relocate. 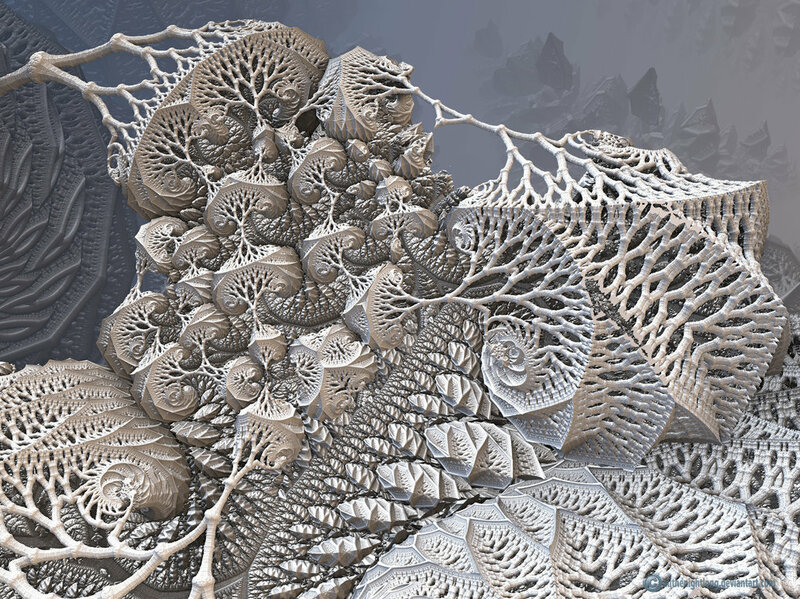 Mass exoduses of skull spiders leave baffling trails of headless corpses. Hello, and welcome back to the third-anniversary celebration of Frightful Fridays! Today's monster continues the theme of doing terrible things to characters. This one definitely wears its inspiration on its bloody sleeve. I hope you enjoy the deadflesh infester, and I'll see you tomorrow with another terrifying monster. Thanks for reading! He's OK. He just wants a hug. 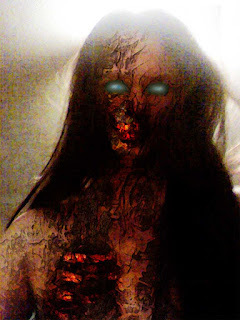 This blood-red zombie moves much more quickly than others of its kind. It has a wicked grin in anticipation of mayhem. Create Spawn (Su) A creature that dies while suffering from deadflesh infestation rises as a deadflesh infester, as an independent creature, 1 round later. Deadflesh Infestation (Su) When a deadflesh infester damages an opponent, it leaves some of its flesh in the wound. The target must succeed at a DC 21 Fortitude save to avoid this infestation. If the target fails, it moves at half its base speed and takes a –2 on attack rolls, damage rolls, and skill checks. The infesting flesh starts with hit points equal to the damage dealt. An infested victim must attempt a DC 21 Fortitude save at the beginning of each of its turns. If it fails, it takes damage as if struck by the deadflesh infester’s claw attack, and the infesting flesh gains hit points equal to the damage inflicted. If the infestation’s hit points exceeds its victim’s current hit points, the victim is staggered. The save DCs are Charisma-based. This is a curse effect. Removing the infestation requires dealing positive energy damage equal to the infesting flesh’s hit points. The infesting flesh uses the deadflesh infester’s SR and Will saves. A successful use of remove curse or more powerful spell also removes the infestation. Deadflesh infestation is not cumulative. A victim currently suffering from an infestation cannot be affected by this ability again. Deadflesh infesters are zombies infused with Abyssal energies, giving them intelligence, speed, and an overwhelming desire to create more zombies in the most gruesome way possible. In combat, they break off teeth or fingers and imbed them into their opponents’ flesh. These fragments take on a life of their own and eventually turn the victim’s body against itself. Powerful infesters can detach fragments of their bodies and direct them to force themselves down victims’ throats. A creature with access to create greater undead and caster level 20 can create a deadflesh infester. Demons with an affinity for the undead also seed skin-bound texts containing a ritual to create a deadflesh infester in deserted locations for the gullible or insane to discover. Hello, and welcome back to Frightful Fridays, celebrating its third anniversary on this blog (plus maybe a little catch up from missing weeks). The next monster "rolls" in to grab PCs' arms and legs...permanently. I couldn't find an image I was happy with, but I'm sure that my searching put my household on a few federal watchlists. So, I am providing a somewhat related image that I will eventually create a monster for instead. By the way, for sadistic or sinister GMs, note that the fleshroil cannot use the treasure it obtains incidentally when it takes arms and legs. However, there's nothing saying you can't allow it to benefit from rings of protection and other passive magical items. I hope you enjoy the fleshroil, and I'll see you tomorrow with another seasonal monster. Thanks for reading! This creature looks like a tumbleweed composed of dismembered arms and legs. Consume (Ex) As a full round action, a fleshroil can tear apart and harvest the limbs of a helpless creature of its size or smaller, killing the creature. It is treated as fighting defensively while using this ability. After it has consumed a creature, it gains hit points equal to the creature’s Constitution score and a 10-foot increase to its base speed. If it has consumed one Medium creature (or the equivalent), it applies the advanced creature template. If it has consumed four Medium creatures (or the equivalent), it applies the giant creature template. It cannot gain more than one of each template. Within 1 minute of consuming four Medium creatures, a fleshroil splits into two identical creatures, both with the same statistics as the original fleshroil (thus losing the templates). 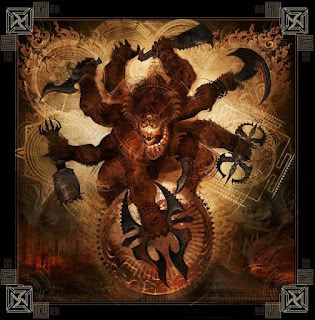 Dismember (Ex) If a fleshroil deals rending damage to an opponent or pins its opponent, it makes a sunder attempt against that opponent as a swift action. If the attempt succeeds, the fleshroil tears off one of the opponent’s arms or legs. The target takes 1d6 points of bleed damage and cannot perform actions requiring two arms (with the loss of an arm) or cannot walk or run (with the loss of a leg). Speculation about the fleshroil, also known as the fleshwheel or limbroll, focuses on two possible origins: it grew from a troll’s (or multiple trolls’) severed limbs or it derives from partially ooze-digested victims. It shares odd traits with both trolls and oozes, making either theory possible. However, it is an undead creature, animated by malign energies created by the trauma of losing limbs. The dim intelligence it possesses drives it to add more limbs to its mass, eventually “reproducing” once it has added enough to its collective. Ghouls and other creatures with a taste for humanoid flesh farm fleshroils and send them out to wreak terror in the surrounding lands while gathering meals for the fleshroils’ masters. A creature with a minimum caster level of 18 that can cast create undead may use that spell to create a fleshroil, but this requires at least two corpses. Hello, and welcome to the latest edition of Frightful Fridays! Real life brought the monster production to a halt, so I'm making up for lost time and publishing a monster a day until Halloween. I also wanted to celebrate this feature's 3-year anniversary with some creepy and/or scary monsters, like this curse-generating skull. I think a lot of players will be unhappy after an encounter with this monster, so I'd suggest using it sparingly. I hope you enjoy(?) the skull of ill omen, and I'll see you tomorrow with a new monster. Thanks for your patience during the delay, and thanks for reading! This jade skull floats just above the ground and radiates a sickly green light. Create Spawn (Su) A creature that dies while suffering from a curse (from bestow curse or major curse) inflicted by a skull of ill omen becomes a new skull of ill omen after 13 days. The new skull is not under the control of its creator. Cursed Backlash (Su) When a creature deals physical damage to a skull of ill omen, the attacker must succeed at a DC 24 Will save or take half the inflicted damage as negative energy damage. An opponent successfully dealing energy damage to the skull must also succeed at a DC 24 Will save or take half the energy damage (damage type does not change). The save DCs are Charisma-based. Cursed Touch (Su) The bestow curse effect on a successful ranged touch attack counts against the skull of ill omen’s uses of its bestow curse spell-like ability. Escalating Curse (Su) If a victim of a skull of ill omen’s bestow curse spell-like ability makes its save, the DC for subsequent uses of its bestow curse increases by 1. For each failed attempt to remove a curse (from bestow curse or major curse) inflicted by the skull, the DC to remove the curse increases by 1. Final Curse (Su) When a skull of ill omen is destroyed, it creates an effect as per cursed earthUM, except it inflicts all effects. Additionally, the creature dealing the fatal blow to the skull must succeed at a DC 26 Will save or be afflicted as if by a double-strength bestow curse (–6 decrease to two ability scores or 12 decrease to one ability score, or –8 penalty on attack rolls, saves, ability checks, and skill checks). The curse cannot be removed with anything less powerful than a miracle or wish spell. The save DC is Charisma-based and includes a +2 racial bonus. Spellwarp (Su) If a caster fails to penetrate a skull of ill omen’s spell resistance and the skull has successfully identified the spell, it can choose the spell’s parameters (target(s), area, etc.). It cannot maintain concentration on a spell it warps in this manner. A skull of ill omen results when a creature dies while under the effects of a powerful curse. Embittered by its death, the victim retains the cursed energy and its body quickly withers away. The skull animates and travels the land to afflict the living with terrible curses of its own devising. It finds a graveyard or other appropriate location and disguises itself as a moss-covered humanoid skull. From its new home, it surreptitiously casts cursed earth, and relishes in the misfortunes wiping out most of the inhabitants. It then moves on to the next settlement to repeat the process. It prefers not to directly harm people, since its curses create more skulls of ill omen, but it will make exceptions for particularly dogged meddlers. A skull of ill omen enjoys collecting cursed items and it researches legends surrounding such items when it travels to a large settlement. It hires evil or gullible adventurers to retrieve the items. Rarely, the skull will use beguiling gift to force an opponent to take a cursed item. It will then falsely promise to remove the curse if the victim does the skull’s bidding. An inert skull is worth 12,000 gp, but it imposes a 20% chance of cursing magic items produced within 200 feet of it. Hello, and welcome to a late edition of Frightful Fridays! I'm keeping with the arachnid theme, and I blame my friend JD, who mentioned something about laser scorpions. I couldn't get it out of my head, and it morphed into the gunner scorpion you see below. It still blasts opposing creatures, but not with lasers. I also threw in a magic item to make up for the lateness. I hope you enjoy the gunner scorpion, and I'll be back next time with a new monster. Thanks for reading! The laser scorpion this author did not have the guts to stat up. This gigantic, slate-gray scorpion has a tail that ends in two stingers, each of which fits loosely within its socket. Speed 60 ft., burrow 40 ft.
Energy Immunity (Ex) A gunner scorpion is immune to the energy type dealt by its incendiary rounds. Hail of Stingers (Ex) Once per day as a full-round action, a gunner scorpion can launch a 60-foot cone of stingers, which deals 8d6 piercing damage to every creature within the cone (DC 22 Reflex half). 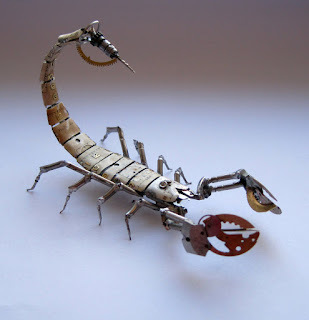 The scorpion is fatigued after using this ability, it loses the benefit of fast healing for 1 round, and it cannot use its ranged attack for 1 round. Incendiary Rounds (Ex) A gunner scorpion has a store of one type of energy within its system. This defaults to fire, but it can eat an alchemical concoction that changes the energy type. This grants immunity to the chosen energy type, and allows the scorpion to add 2d6 points of energy damage to its stingers. As it takes a while to apply the energy to its stingers, this reduces its rate of fire to 2 stingers per round. Overload (Ex) The energies stored within a gunner scorpion explode when the creature dies. Every creature in a 30-foot spread takes 6d6 damage of the energy type the scorpion uses for its incendiary rounds (DC 22 Reflex half). Someone capable of controlling the scorpion can order it to “self-destruct” to deal this damage. Stingers (Ex) A gunner scorpion fires can fire up to 4 stingers at multiple targets, no two of which can be further than 30 feet apart. The stingers have a 60-ft. range increment. Engineered by races that use scorpions as weapons of war, gunner scorpions are devastating creatures employed by those races. These creatures primarily attack at range, but they have learned techniques to deal with opponents within melee range of their claws and stinger. They are especially effective in close combat with spellcasters. They have internal stores of fire within their hard carapaces, allowing them to apply flame to their ranged stinger attacks, but their controllers can feed them material that changes the composition of the energy for 24 hours. Gunner scorpion controllers either master vermin empathy or employ magic items to give orders to the creatures. Slot head; Price 28,000 gp; Weight 1 lb. Images of multiple species of vermin cover this iron crown. When placed on the wearer’s head, the images crawl around the crown in disconcerting fashion. The wearer can control vermin and vermin-like magical beasts with an intelligence of 2 or less as if she possessed the wild empathy ability. If she already has the wild empathy ability, she gains a +4 enhancement bonus on wild empathy checks to influence such creatures. Once per day, the wearer can transform her skin into one or more swarms, as per swarm skin, but she may only choose vermin swarms. Hello and welcome back to this edition of Frightful Fridays! Drejk posted this beauty on my wall this week, and it inspired me to create the sanguinary spider. It loves your character's blood, and it has many ways of extracting it and making sure the blood keeps flowing. I hope you enjoy(?) the sanguinary spider, and I'll be back next time with a new monster. Thanks for reading! Another terrifying arachnophobic nightmare awaits here. 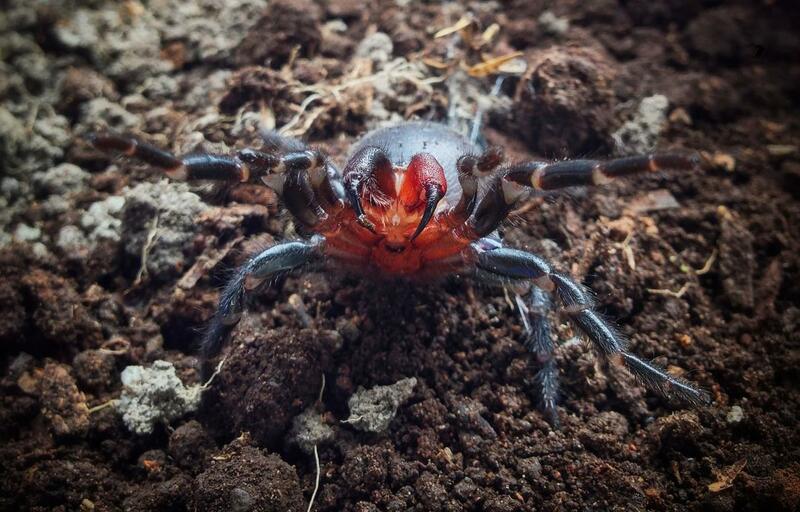 This enormous spider has a blood-red underbody and brown splotches cover the top of its body. Its mandibles drip with blood, most likely not its own. Blood Puppet (Su) When a sanguinary spider deals a total of 20 points of bleed damage, it can create a blood golem from the collected blood. The golem attacks the nearest opponent until it is destroyed. If the spider dies or the golem moves more than 20 feet from the spider, the golem splashes harmlessly into a pool of blood. Hemorrhagic Aura (Su) A creature that begins its turn within 20 feet of a sanguinary spider must succeed at a DC 20 Fortitude save or take 1d2 points of bleed damage. This bleed damage stacks with bleed inflicted by the spider’s bite. Anticoagulating Poison (Ex) Bite—injury; save Fort DC 20; frequency 1/round for 6 rounds; initial effect 1d6 Con; secondary effect bleed damage inflicted by the spider cannot be ended with a Heal check, and a creature applying magical healing must succeed at a DC 20 caster level check to stop the bleed damage; cure 2 consecutive saves. Sense Blood (Ex) A sanguinary spider can immediately sense the presence of warm-blooded creatures in a 60-foot radius as if by scent. It can detect exposed blood within a mile. Sitting at the center of a bloody mass of webs, sanguinary spiders prefer to wait for prey to stumble into their territories. Though they can sense blood-filled prey from a great distance, they wait until such prey get within range of their hemorrhagic aura before launching an attack and finishing the job started by the aura. If potential meals flee from sanguinary spiders, they still collect enough blood to sate their hungers until more prey arrives. In dire circumstances against troublesome foes, the spiders can animate blood into humanoid facsimiles for protection. 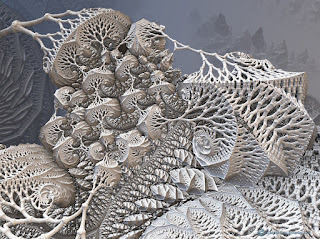 The creatures spin webs from congealing remains they do not feed upon; these webs do not entangle prey, but they are unnervingly sticky from the drying blood. Hello, and welcome to this week's Frightful Fridays! Today's entry is courtesy of my friend Drejk, and it sat in my folder for a long while before I decided to do something with it. The ki rat uses the rules for the Pathfinder Unchained monk, which suits the creature better than the typical monk. At any rate, if you unleash a ki rat on your players, they won't want to underestimate this rat. I hope you enjoy the ki rat, and I'll see you next time with another monster. Thanks for reading! This hairless rat with a sagacious mien is blind but moves with surprising grace. Insightful Combatant (Su) A ki rat gains an insight bonus equal to its Wisdom modifier to its Armor Class, attacks, and damage. Ki Powers (Su) For purposes of its key powers, a ki rat has an effective monk level equal to its Hit Dice. Ki rats are exceptionally powerful animals that possess many abilities associated with monks. The prevailing thought is that ordinary rats at temples where monks trained absorbed the ki that flowed into and out of the monks. These rats lost their sight but gained awareness of their environment and their own inherent power. 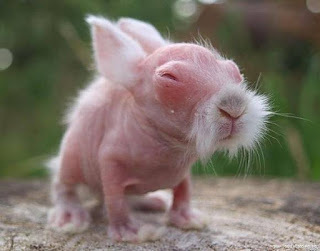 Many ki rats roam the world and use their power and wisdom to right wrongs, free the falsely imprisoned, and impart their own knowledge to those willing to learn from a rat. Some of these rats have settled down and started temples of their own, usually teaching aspiring monks through a proxy. All ki rats have a love for wind instruments, and carry reed flutes, from which they produce soothing melodies. Hello, and welcome back to a new Frightful Fridays! 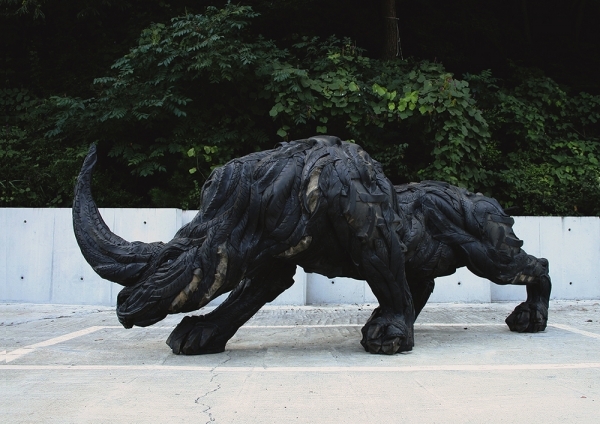 Today's monster is courtesy of Jason Mitchell, who pointed out the tire sculptures in the link below this week's image. It inspired me to create a tar-covered rhinoceros that can gore opponents and glue them to its hide and subsequently crush them. I hope you enjoy the tarrhino, and I hope GMs will use it to literally stick it to their characters. I'll be back next time with a new monster. Thanks for reading! This humongous, black rhinoceros drips tar that sizzles when it hits the ground. Sticky Hide (Ex) A tarrhino’s hide is highly adhesive. When it strikes an opponent with its slam attack, it gains a free grapple attempt. If it succeeds, it does not gain the grappled condition, and it only deals 1d6 fire damage to a creature with which it maintains a grapple. It can adhere up to 8 Medium creatures (or an equivalent number of smaller or larger creatures) to itself. As a full round action that provokes attacks of opportunity, the tarrhino can roll, dealing its slam damage (plus 1-1/2 Strength bonus) to all creatures stuck to it. Additionally, a creature striking a tarrhino with a manufactured melee weapon must succeed at a DC 19 Reflex save to avoid the weapon sticking to the tarrhino. Freeing a stuck weapon requires a successful disarm attempt, and the creature’s hide grants a +4 racial bonus to CMD against disarm checks. Tar Spit (Ex) If a tarrhino’s tar spit attack hits its target’s touch AC but otherwise misses the target, it deals no damage to the target. However, the target is affected as if hit by a tanglefoot bag (with a DC 19 Reflex save to avoid becoming glued to the floor). A tarrhino’s tar spit has a range increment of 20 feet. Ancient battles between earth and fire elementals left melted corpses behind, some of which dissolved into pools of semi-sentient tar. As animals blundered into the tar and succumbed to its sticky embrace, the slumbering sludge remembered the victims’ shapes. When the tar awoke its torpor, it chose its favorite form, that of the rhino, before leaving the pits wherein the tar slept. Despite their elemental origins, tarrhinos must eat, and they range over large areas to hunt prey. Their preferred method of hunting is to glue a victim in place with expectorated tar and then pulverizing the victim at the end of a thunderous charge. They also enjoy fighting multiple creatures at once, so they can stick unsuspecting foes to their hides and roll around to crush those that cannot free themselves. Tarrhinos are usually covered in stuck weapons and various items, making them virtual walking treasure chests for stalwarts who can defeat them. It's the most Superstar time of the year. It's a wee bit early (three months), but this will keep it out of competition with the holiday season to encourage more entries and voting. Speaking of which, vote for your favorite items here! Hello, and welcome to this week's Frightful Fridays! This one has been floating around for a while, but my friend Owen recently brought it up again. Inspired by this YouTube video, I present the surprise elemental, complete with "age categories" like proper elementals. Its purpose is to mess with characters (and players) who presumably figure out how to most effectively kill it, only to find out how wrong they are. It's quite fiddly with all the random rolling, so I would caution against throwing a dozen of these out there (despite what their organization line says). Yes, this is a surprise. An exclamation point pops out of thin air and begins attacking. Now You See Me (Su) A number of times per day equal to a surprise elemental’s Charisma modifier, it can take a full round action, which does not provoke an attack of opportunity, to teleport itself up to twice its movement rate and make a single attack. The target of the attack must succeed at a Perception check opposed by the elemental’s Stealth check, or it is flat-footed with respect to the attack. Sneak Attack (Ex) A surprise elemental deals sneak attack damage as if it were a rogue with levels equal to its Hit Dice. Surprise Defense (Su) A surprise elemental must be threatened by at least one other creature to take damage. Variable Resistance (Su) A surprise elemental begins combat with the listed resistance to a random energy type, based on a d4 roll (1: acid, 2: cold, 3: electricity, 4: fire). When it takes damage from the resisted type of energy, reroll for a new type of energy (for example, if it was originally resistant to cold, roll a d6 for the new resistance: 1–2: acid, 3–4: electricity, 5–6: fire). Will This Work? (Su) A surprise elemental begins combat with spell resistance equal to 10 + CR. Each time a spell overcomes its spell resistance, its spell resistance increases by 1. Each time a spell fails to penetrate its spell resistance, its spell resistance decreases by 1. Speed 40 ft., burrow 20 ft., climb 30 ft., fly 60 ft. (average), swim 60 ft.
Versatile DR (Su) A small surprise elemental begins combat with DR 5, bypassed by a random weapon type based on a d6 roll (1–2: slashing, 3–4: piercing, 5–6: bludgeoning). When an attack bypasses its DR, reroll for a different weapon type (for example, if slashing weapons originally bypassed its DR, roll a d6 for the new weapon type: 1–3: piercing, 4–6: bludgeoning). Speed 50 ft., burrow 30 ft., climb 40 ft., fly 60 ft. (average), swim 60 ft.
Versatile DR (Su) A medium surprise elemental begins combat with DR 5, bypassed by a random weapon type based on a d6 roll (1–2: slashing, 3–4: piercing, 5–6: bludgeoning). When an attack bypasses its DR, reroll for a different weapon type (for example, if slashing weapons originally bypassed its DR, roll a d6 for the new weapon type: 1–3: piercing, 4–6: bludgeoning). Speed 60 ft., burrow 30 ft., climb 40 ft., fly 90 ft. (average), swim 90 ft.
Versatile DR (Su) A large surprise elemental begins combat with DR 10, bypassed by a random weapon type based on a d4 roll (1: slashing, 2: piercing, 3: bludgeoning, 4: magic). When an attack bypasses its DR, reroll for a different weapon type (for example, if slashing weapons originally bypassed its DR, roll a d6 for the new weapon type: 1–2: piercing, 3–4: bludgeoning, 5–6: magic). Speed 70 ft., burrow 40 ft., climb 40 ft., fly 90 ft. (average), swim 90 ft.
Versatile DR (Su) A large surprise elemental begins combat with DR 10, bypassed by a random weapon type or material based on a d6 roll (1: slashing, 2: piercing, 3: bludgeoning, 4: magic, 5: cold iron, 6: silver). When an attack bypasses its DR, reroll for a different weapon type (for example, if slashing weapons originally bypassed its DR, roll a d10 for the new weapon type: 1–2: piercing, 3–4: bludgeoning, 5–6: magic, 7–8: cold iron, 9–10: silver). Versatile DR (Su) A large surprise elemental begins combat with DR 15, bypassed by a random weapon material or quality based on a d8 roll (1: magic, 2: cold iron, 3: silver, 4: chaos, 5: good, 6: evil, 7: lawful, 8: roll twice ignoring a result of 8 [a weapon must possess both qualities/materials to bypass the elemental’s DR; if the same result is rolled, double its DR). When an attack bypasses its DR, reroll for a different weapon material or quality as previously noted. In the chaotic demi-plane known as the Plane of the Unexpected, surprise elementals serve as wardens and guides for visitors to the plane. Stalwart creatures in their home plane, these elementals transform into unpredictable killers when they travel to other planes. Sages who have studied surprise elementals concluded that the relative structure and order of other planes drives the creatures to madness. No two encounters with surprise elementals are the same. The creatures use a variety of unusual tricks when they attack, and they possess bizarre, random defenses that change during battle. Additionally, surprise elementals have a different appearance from one another and usually take the form of the local concept of surprise (one might be virtually invisible but make sudden, loud noises, while another might look like a massive jolt of electricity, for example).